I’ve taken some of my own advice, and left the Old Leatherman alone for a few months. However, not so with the research team, as I did learn that this summer they were back at the Sparta Cemetery for another (albeit unpublicized) try at locating some DNA evidence from his remains. Apparently they were again unsuccessful. The original court order granted them one year to do their forensic research on the Leatherman, and that will expire soon, so there may be more details yet to emerge from their findings. 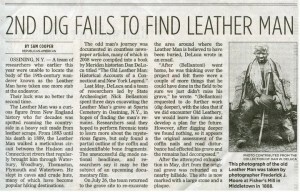 Dan Deluca, the leading authority on Ol’ Leathery, and a member of the research team will be doing a talk at the CT Museum of Natural History on November 12 at 3pm. If you are interested in Leatherman lore, I would highly recommend attending one of Dan’s talks. 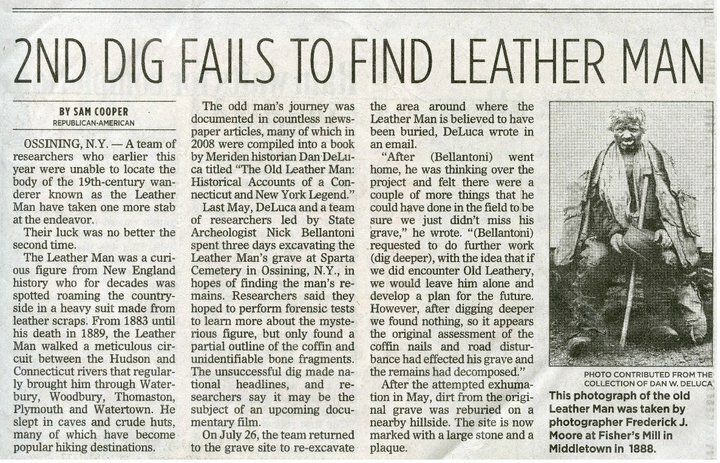 I found out researchers were going to try to exhume the remains of the Old Leatherman to learn more about him. I used this site and facebook to raise awareness in an attempt to get them to reconsider their actions on the grounds that he seemed to guard his privacy while alive, so his remains should be left alone. They went forward with the exhumation in late May 2011, and did not find any remains where they dug. They re-buried the dirt and some iron nails in a plain pine box on higher ground in the middle of the cemetery, had a short religious ceremony, and placed a new headstone at the site. They went back in July to dig in the area of the original gravesite, and found nothing but a golf ball. After my five month hiatus, I will be trying to spend some time updating and streamlining this site in the coming weeks. I’m aware that the Spam comments got out of control, and I’ll try to fix that too.